Friendsgiving: The Best Part of Thanksgiving! The popularity of the concept of is both strange and familiar to me. Military members have been hosting friends instead of family for years, without fanfare. Separated from traditional family by distance, money, or to avoid the drama with relatives back home, we’ve embraced the strays (and arrived as said strays!) as our own for decades. And I, for one, couldn’t be happier. In fact, my family and our closest military friends rented a house in the mountains for four days of Friendsgiving, eschewing biological family members this year. Let me tell you, the excitement of planning, prepping, and packing began as soon as we booked the lake house back in August. Everything from pumpkin pie duties to paper towel buying has been lovingly shared among the three families attending. If we’re honest, our military and civilian friends are far more important to our everyday lives than second cousins from Boise. They’re the ones to bail out us out from the deployment disasters and step in during times of ‘out of milk for cereal’ crises. By virtue of human nature, it’s completely reasonable to want to hang out with dear friends and celebrate gratitude instead of debate hot topic politics with drunk Uncle Arthur. In the early years, Friendsgiving was an addition to Turkey Day, either gathering before or after Thanksgiving, typically meeting up with friends from back home in the town where your family remained. Later, the party morphed into a casual meal, either with leftovers from yesterday’s Thanksgiving meal or pizza and beer for the Friday night after. Friendsgiving’s rise in popularity has increased tremendously in recent years, although the first recorded instance of the mashed-up word was back in 2007. On Twitter, of course. Many of us, however, remember from way back in the day, the notion from our beloved sitcom, Friends. Who can forget the raw turkeys on Monica and Joey’s heads?! "The One With All The Thanksgivings" episode is one to re-watch during your next Friendsgiving binge TV watching. One of the best parts of Friendsgiving is that it's customizable. Everyone hates canned cranberries? Leave them on the shelf. Don’t want to cook a whole Thanksgiving meal? Call a local grocery store to cater the whole kit and caboodle. The options are as creative or traditional as you want them to be. There’s much to cheer for after a paper plate and tossable utensil meal, this I know. As a group, it’s been an extra-long and exhausting few years in the service. It seems as though someone is always missing during friend dates throughout the year, so it’s a treat to get away together. We can’t wait to sit fireside on the lawn at our mountain rental. We’ve planned for hot drinks and s'mores each night. Inside, the house is divided on what to watch on TV: holiday Hallmark movies or football. Our kids are thrilled to have their own space, complete with bunk beds and pool table. We didn’t forget the four-legged family members! The pet deposits are paid and they’ll be joining us for the festivities, even if they have to stay off the couch. Of course, mountain getaways are not required. 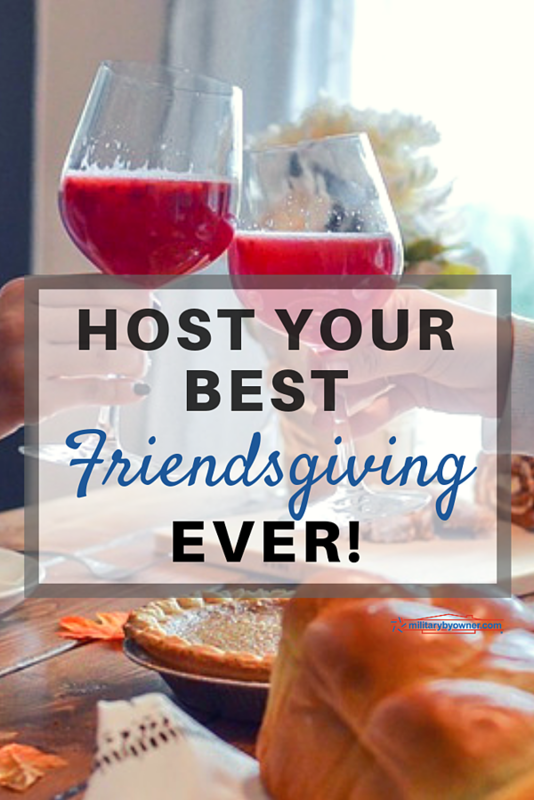 There are plenty of opportunities to make Friendsgiving your favorite holiday at your very own house. Buck tradition and go wild—pick a Friendsgiving restaurant. Eat. Go home with friends. Relax with a course of dessert and coffee. Consider a day and overnight celebration. It’s fun, comfortable, more like family, and very responsible. Make it an all-day affair starting with breakfast or brunch, move onto plenty of snacks, and finally, dinner and dessert. Offer to make the main courses, such as the turkey and ham, but have guests bring the sides. Plan and work in big batches of food to freeze ahead: breakfast muffins, desserts, and appetizers save nicely. Choose one or two cheerful cocktails and make by the gallon to offer all day long from self-serving spout containers. Buy plenty of to-go containers to have on hand and send home full boxes of leftovers for friends to enjoy the next day. Have a kid’s room or area where kids can be kids. Provide easy access to TV, games, and other activities to keep them occupied. Most of all, don’t forget to wear stretchy pants. And buy antacid! How will you be celebrating Thanksgiving? Have I convinced you to try a Friendsgiving this year? If holiday travel is part of your grateful day, skim through MilitaryByOwner’s travel blogs and resources. You'll find tips for everything from Space A travel to on base lodging and healthy eating on the road.